Did you purchase your tickets off-line or receive from a friend or business? Fill out this form here to make sure you are registered for the night! Need help learning to bid? See this video! Video: Learn to Online Bid! 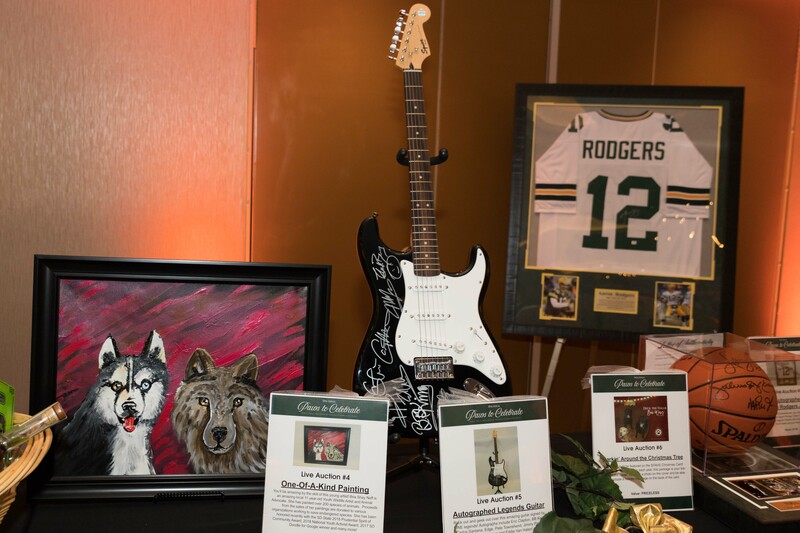 Paws to Celebrate is a Silent and Live Auction event to raise funds for homeless and neglected pets in Sioux Falls and the surrounding communities. Each year you help us raise over $60,000 for the care and treatment for the animals looking for forever homes at the Sioux Falls Area Humane Society. With your support, these animals are cared for, loved and comforted as they wait for the second chance they so deserve. There are a few new exciting things this year including a seated meal and online bidding! We will still have great local chefs providing appetizers, desserts and more! All silent auction packages will be accessed with online bidding so a mobile number will be required. We will have Bid Assistants at the auction to assist you should you need help with bidding online. Where is Paws to Celebrate 2019? When is the latest I can purchase tickets? Online ticket sales will end at noon, Friday April 26th. There will be a limited number of tickets available at the door. What is the attire requirement? The attire requirement is dependent on how fancy you want your night to be. Semi-formal to business casual is typically what the attendees of the event wear. How can I speed up my check-in process? After you purchase your tickets, you will be given a code if you wish to go back and update your information later. The more up-to-date your information is the smoother your check-in will be. Make sure you update the names on each ticket before the event, so we know who they are assigned to! If my name isn't in the system what happens then? You will need to present your ticket and tell us your name at check-in. If your name is not in our system we will need your First and Last Name and mobile number. We will run your card at check-out. How do I pre-register if I bought my ticket offline? This will take you to a pre-registration page to enter your information. You cannot buy tickets from this page. How do I pre-register if I received my tickets from a business or friend? Will there be seating for everyone? Yes. There will be a seated meal for the main course provided. There will also be appetizers, desserts and more from the best-of-the-best local chefs! The meat option is chicken with roasted red potatoes and chef's choice vegetables. The vegetarian option is a quinoa stuffed bell pepper, roasted red potatoes, and chef's choice vegetables. How many drink tickets will I receive? Every ticket purchase comes with 2 free drinks. If you wish to use one of your free drinks, show your card to the bartender and they will punch your card when you receive a drink. If you have used all your punches, drinks are still available from the cash bar. How do I get set up with online bidding? When you purchase your ticket online, you will receive a message to take part in Online Bidding with set up instructions. At check-in, you will be asked if you received this message. If yes, you will just need to click the link! If not, you will be asked for your mobile phone number and will momentarily receive a text message. If you do not receive a text message, please notify a staff member or volunteer for assistance. You must purchase a ticket to attend the event to access our online bidding. We will have online bidding this year, so a mobile number will be required when you purchase a ticket or check in to the event. Once logged in, your bidding number will be displayed under the menu. - Click the house to go back to your home screen. - Bid More - Bid more than the next increment or set your Max Bid! Bidding will automatically continue in your favor until max bid is reached or until the auction closes. If you bid is lower than the highest max bid on that package, you will be prompted to enter a higher bid. If you are outbid, you will be notified via text message. You will also see a notification on your home screen. Do I have to use the online bidding to win an item? If you would like to bid on any of the silent auction items, you will need to use the online bidding platform. We will have Bid Assistants available to help you understand the process, as well as instructions in the program and at each table. You will not need to use online bidding to bid on Live Auction items, to enter the raffle drawings, or purchase a bottle from the Wine Pull. What items can I bid on without online bidding? Our Live Auction items will not utilize online bidding and neither will our raffle items or wine pull. Will the items still be on the tables to view? Yes. All the silent auction items will still be able to be seen in person and taken home the same night of the event. How do I use a Bid Assistant? Bid Assistants will be volunteers who will be at the event to help you, should you need assistance understanding the bidding process, helping place a bid on your own device, or helping place a bid in general. Provide the number or name of the package you wish to bid on, and the amount you wish to bid. The Bid Assistant will show you how to check the current bid and how to re-bid on your own if you are outbid again. The Bid Assistants are available to help teach you the online bidding process so you can successfully bid on your own! Can I make a donation via the online bidding? Yes! To make a donation, select the Donation button your home screen. Choose a preset amount or select the Custom Amount button. What happens with the bids when the auction closes? Once the auction closes the guest with the highest bids on the packages will win. Check your Bids area to view what you have won! You may then proceed to the check-out table, where your winnings will be confirmed and then given to you. Please do not take items off the tables yourself. Our volunteers will collect them for you after you have proceeded through check-out. If I win something what do I do? If you win an item, please proceed to check-out. Do not grab your items from the tables, our volunteers will collect those for you once you have completed the check-out process.